CityFest 2015 will take place under the Hillcrest sign on Aug. 9 from 12 p.m. to 11 p.m. The scene at CityFest in Hillcrest. 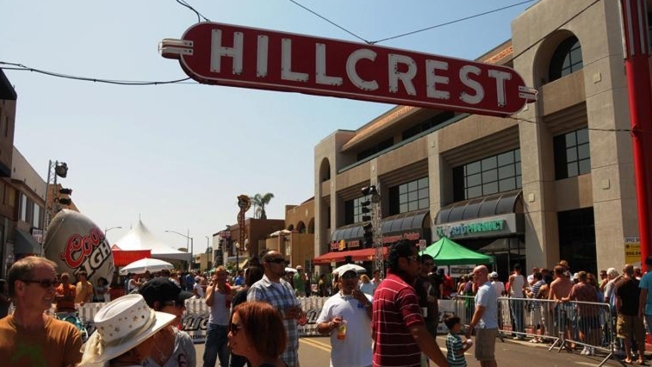 Running strong for more than three decades, Hillcrest will host its annual CityFest next weekend, a lively street fair held under the community’s namesake sign. The free, 31st annual CityFest will flood the streets surrounding the Hillcrest sign on 5th and University avenues on Aug. 9 from 12 p.m. to 11 p.m. The celebration – which typically attracts more than 150,000 attendees each year – will feature live music, plus arts, crafts and food vendors spanning more than six blocks. Organizers say more than 250 artisans are scheduled to take part in the party. There will also be an international food court and a 21+ beer garden. Family-friendly attractions include a water slide, a kid’s zone, games and a petting zoo. After the sun goes down, DJ’s will take the spotlight on a stage beneath the famous Hillcrest sign, spinning tunes for the second part of the shindig, known as CityFest Night, which often turns into one big, outdoor dance party. CityFest began in the summer of 1984 when Hillcrest residents gathered on 5th and University avenues to celebrate the re-lighting of the Hillcrest sign in what later became known as the first-ever CityFest. Today, proceeds from the annual summertime street fair go towards the upkeep of the Hillcrest sign and other beautification projects in Hillcrest. For more details and updates about CityFest, visit the event website or Facebook page.